The price listed is for a limited time only - Now through Mother's Day, Sunday May 8, 2011 - after that, the price will be $10.00. This listing is for the instructions to make these earrings, not the actual piece of jewelry. It does not include any materials or tools. 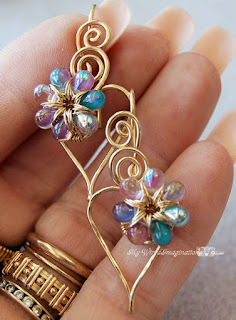 This tutorial will show you step by step, how to create these wonderfully charming heart earrings –with or without flowers – each from one piece of wire. The instructions to create and attach a tiny little flower to each earring are included. ►►PLUS 2 bonus variations. Tons of detailed techniques and diagrams to help you complete this project successfully. – Almost as good as having me right there with you! This tutorial is 37 pages with a whopping 145 clear crisp photos. Please don't be intimidated by the size - the basic earring construction is covered in the first 18 pages, with the rest covering the flowers, bonuses, and detailed techniques. This tutorial was written with the beginner in mind, though having some wire experience is helpful. This is a companion tutorial to my “Charming Hearts” tutorial. Knowledge of that tutorial is helpful, but not necessary. 14 tear-drop style or briolette beads 6x4mm or smaller. 36 inches (91.4cm), 28ga round dead soft wire. Flush cutters; Sharpie (permanent marker); ruler, and cleaning cloth. Flat nose; chain nose; round nose pliers; nylon jaw pliers; and wire rounder or file. Large stepped round nose pliers, bail making pliers, or ½ inch round dowel for shaping. Optional: Chasing hammer and bench block. This is a PDF file - To view this tutorial you will need a copy of Adobe's Acrobat Reader, which can be downloaded FREE, however most computers with basic programming are already capable of reading a pdf file. The tutorial with be sent within 6 to 12 hrs of receiving payment by Bobbi herself, in most cases MUCH, MUCH sooner; If you have several e-mail addresses, please specify which one you prefer I use, otherwise it will just be sent to the e-mail address listed in your PAYMENT information. PLEASE NOTE - if you have heavy spam catchers on your e-mail, please check the spam or trash folder just in case. I hope you enjoy making these pieces, please contact me with any questions you have about it. You may post pictures of the pieces YOU make with this tutorial, in any message boards, forums, or blogs you have, or are a part of, and credit where you learned this is appreciated. You may make pieces for sale from this tutorial, but please don't MASS produce them - again credit where you learned the design is greatly appreciated. However, PLEASE respect ownership of intellectual property, and DO NOT post the actual tutorial in forums, blogs and message boards; DO NOT mass produce, or share this tutorial in any form. She just relisted it. It's $8. :) Hurry up Cindi!